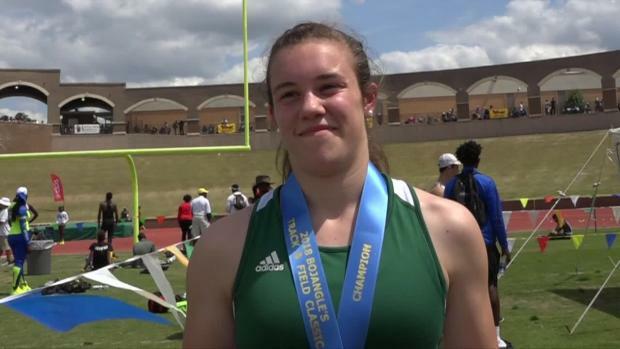 Lindsay Absher (West Forsyth) came into the NCHSAA 4A State Championships as a heavy favorite after jumping the NC State Record of 13-2 earlier this season. Though Absher is a standout, the pole vault field was the deepest it's ever been in 4A history. The girls Pole Vault opened up at 8-0. Absher didn't jump in the competition until 11-0. She'd go on to clear 11-0, 11-6, 12-0, and 12-6 on her first attempt. McKenna Brunick (Leesville Road) bowed out at 12-6 as Absher locked up the state title. From there Absher moved the bar up to 12-10. She cleared it on her second attempt. This gave Absher the overall NCHSAA Indoor State Championship Record. From there she went to 13-2, her PR on the season, and cleared it on her first attempt! She went up to 13-4 and missed on the first attempt, but cleared it on her 2nd attempt. 13-6 was the next height, which would move her up to US#2 and break the old state meet Pole Vault record by 10.5 inches. On her first two attempts Absher was very close, but knocked the bar down. But on her third attempt she was perfect setting a 4 inch PR! Absher didn't have a crazy celebration. She stayed calm to prep for the next height, 13-8. On all three attempts Absher wasn't able to get her feet over the bar ending her day. This marks Absher's 4th meet of the year that she's exceeded 13 feet. What was great to watch that even while Absher was setting record after record, she was very calm and even was wishing friends good luck that were competing in the boys pit. She wanted to see others succeed and achieve their goals just as she was. 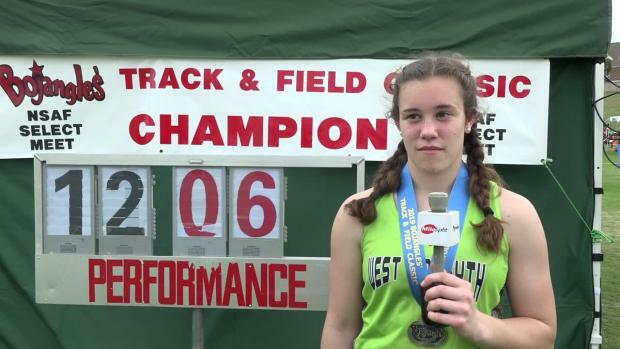 Absher was close to the indoor state record as a junior, but wasn't able to get over it throughout the indoor season. But after jumping 13-1 at Titan Clash #2 she's be able to move up to incredible heights. Absher will head into the national meet in a month as one of the top competitors. It'll likely take near 14 feet to win, so she'll get to work on new poles to prepare for the big event.